What Does the Neuroscience Say Are the Factors that Contribute Most to Student Achievement? Almost every teacher I meet has a theory about kids. Well, actually, he or she has many theories. But if I ask the million dollar question, “What is it that contributes most to student learning?” the teacher usually gets quiet. I like that response. It’s good to be thoughtful about questions like that. The great news is that recent neuroscientific studies are opening up the brain of the student and telling us what matters most in learning. You might be surprised at what they’re finding. While a HUGE numbers of variables may influence the brain on the macro level (physical environment, food, safety in the classroom, interest in the content, etc.) it turns out that very few factors influence student learning inside our head at the micro level. In fact, the number of factors is so few, I highlighted them in the new ASCD book, Teaching with Poverty in Mind. But let’s say you want just a few goodies from the book. I trust you; I know you’ll want to buy it soon! Let me share just four with you. Let’s start with how we learn. While we naturally and accidentally “pick up” millions of bits of information daily, our focused attention is what tells our brain to “log this in and save it.” Part of the brain tells you to “save” the learning, the nucleus basalis. This skill, locked in attention, can be taught. Second, our brain has to be able to process what is occurring, making the processing and reasoning pathways highly valuable. This skill can be, and must be, taught. But much of these tasks ask you to juggle more than one item in your working memory. The strength of the working memory is another critical variable in learning. This must also be taught. Each of these neural events has to occur in a sequence, so it turns out that the temporal ordering of every step is critical. Now, I’m the first to admit that other variables come into play. We know that students need to feel safe to take risks and a host of other variables. But the so-called environmental factors each influence these neural events. For example, unless I feel safe in the classroom, I might not be able to pay attention. So, for the moment, trust me. Those four neural events would be near the top of any neuroscientist’s list for learning. How do I know that? What makes me so sold on those four? Well, you know I love the research, so here it is. First, the science is solid when you consider each system separately. But they work synergistically. When one of them is off, others falter. That’s why kids with serious AD/HD (low executive function) struggle in all areas academically. Now, the information I’m going to share with you is exceptionally powerful. However, only 1 in 100 educators who reads email this will actually implement these findings. Why? In spite of the solid science behind what I am sharing with you and, in spite of the “miracles” that these applications can produce in your kids, many of the policy-makers have gotten so lost in filling out forms, inept mandates, feel-good “professional” communities, that they forgot the real goal of education: prepare kids for the real world with social skills and thinking skills. OK, enough of that. What can you do to boost these four brain functions? Actually, it’s easy. In fact, when I tell you, you’ll think it’s too easy. That’s the problem. People want things to be hard. People want fancy names for things with expensive packages. They want their school to have to order a $50,000 program (or not). But that’s not how your brain changes. 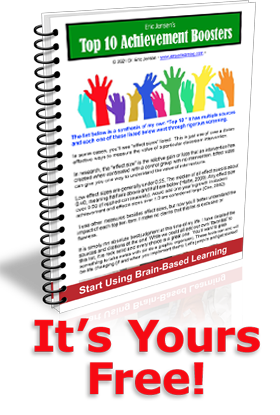 Your brain changes for free. You just need to know how. There are four things that will make cognitive miracles happen. To build attentional span, give kids behaviorally relevant tasks that absolutely require focused attention, so that their brain must strengthen and lengthen their attentional span. This process includes high-interest reading material, reflective writing assignments, learning to play an instrument, painting, graphics work and martial arts. The next process is processing skills. This can be done by role modeling social skills, skits, teaching models of thinking, writing and editing, giving thinking maps, talking through the process with a partner or lots of trial and error. You can build working memory, sequencing and processing speed through the use of games like chess, card games, board games like Spoons and Speed, the video game Brickbuster, the board game Blink, and Perfection. Now comes the hard part: the kids have to do these activities with focus and vigor. That means the teacher must get kids excited about them first, and then play these games for 20 hours total. That’s twice a week, 75 minutes at a time for eight weeks. What’s the payoff? At the University of California, cognitive neuroscientist Silvia Bunge has been a pioneer in this area for years. When the experiment began, Ms. Mackey, professor Bunge’s graduate student who supervised the study, thought she might see gains of 3 to 6 points, at most. The researchers knew some improvement was possible. But they were shocked. The children’s reasoning scores, on average, leapt 32%, or 13 IQ points. What’s the relevance of that gain? Some schools have kids for 12 years that don’t gain that much! 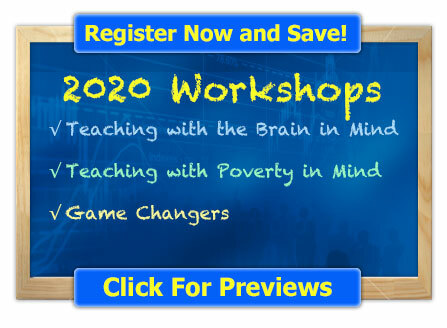 Here, we’re talking about just 20 hours of “brain training!” Is any curriculum you are teaching boosting IQ by 13 points in the next 20 hours? What is being taught in any class, by any teacher, that is making more progress than that? That’s almost one IQ point per hour. That’s the potential of targeted teaching. But you have to commit to the process and ensure that it gets done. Now, go have some fun and make another miracle happen! REFERENCES Ferrer E, O’Hare ED, Bunge SA. (2009) Fluid reasoning and the developing brain. Frontiers of Neurosci. May;3(1):46-51. Jaeggi SM, Buschkuehl M, Jonides J, Perrig WJ. (2008) Improving fluid intelligence with training on working memory. Proc Natl Acad Sci U S A. May 13;105(19):6829-33. Jaeggi SM, Berman MG, Jonides J. (2009) Training attentional processes. Trends Cogn. Sci. May;13(5):191-2; author reply 192-3. Epub 2009 Apr 9. PubMed PMID: 19362513. Molinari M, Chiricozzi FR, Clausi S, Tedesco AM, De Lisa M, Leggio MG. (2008) Cerebellum and detection of sequences, from perception to cognition. Cerebellum;7(4):611-5. Wendelken C, Ditterich J, Bunge SA, Carter CS. (2009) Stimulus and response conflict processing during perceptual decision making. Cogn Affect Behav Neurosci. Dec;9(4):434-47. Zanto TP, Gazzaley A. (2009) Neural suppression of irrelevant information underlies optimal working memory performance. J Neurosci. Mar 11;29(10):3059-66. I appreciate your work. I’ve used it for years to help focus lesson plans, and for improving non-fiction reading. This article is on target for struggling readers who need to develop the cognitive discipline necessary for critical thinking about text. You can’t teach a brain that is not engaged! Great information – we’ve actually started a before school thinking skills program. We have physical games in gym, board games, puzzles, etc. for our students instead of the usual holding room in the morning. The results have been great and as an aside, less students are tardy to school because they don’t want to miss the fun. Students are also more ready for the instructional day to begin.